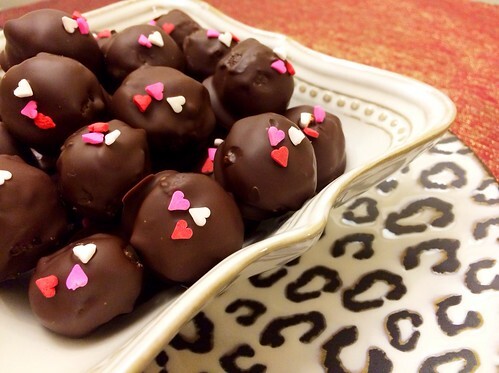 Make a batch of these for your Valentine instead of picking up one of those boring “store-bought” chocolates. Or keep them all to yourself, there’s no judgment here. **Warning** your truffles recipient may fall even more head over heels for you after trying these Dark Chocolate Raspberry Cake Batter Truffles . Mix together dry ingredients (cake mix, flour, and sugar) in a bowl. Melt butter. Add melted butter, milk, and raspberry flavoring to the dry mixture. Stir until it forms a dough-like consistency. It may still be a bit flaky but that’s OK. If you think it’s too dry you can add another drop of milk. Use your hands, or if you have a melon baller (It helps form nice round drops of dough) use this, to form small balls with the dough. Lay them out on the parchment paper lined cookie sheet. Put the dough balls in the refrigerator to cool for 30 minutes. After they have cooled, melt the chocolate for dipping. Using your fingers, dip each dough ball into the melted chocolate. Roll until it is completely covered. Place the truffle back on parchment paper. Repeat with each dough ball. Last step: Put the cookie sheet lined with sprinkled truffles back in the fridge for 15-20 minutes to fully harden. 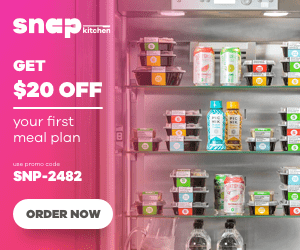 Previous Post Blue Apron Meals Review- An Ingredient Delivery Service!